Sign my guestbook. View my guestbook. 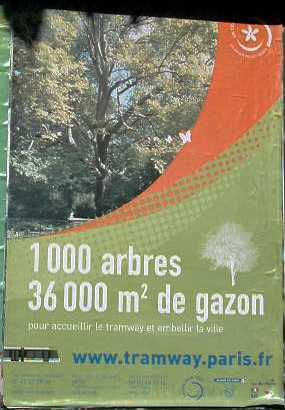 1,000 trees will be planted as part of the tramway project, in an effort to improve air quality in Paris. 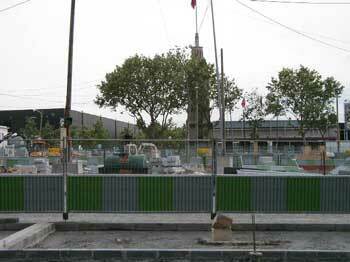 Tramway construction near the Porte de Versailles in the 15th arrondissement. This government building is part of a large complex that stretches along the southern border of the 15th. There are many large employers in this area, so good public transport here is a must. The Paris metro system augments its funds by selling advertising at its metro station entrances. I especially appreciate the way this iPod ad compliments the historic Guimard (art nouveau) entrances. Yesterday we walked to the tramway construction site at the southernmost edge of the 15th arrondissement (our arrondissement). I wanted to see the tramway construction site. This tramway is being built because the public transportation system in Paris, as wonderful as it is, is somewhat lacking in cross-town lines. So, for example, if you live in the southern part of the 13th arrondissement and you work near the southwest corner of the 15th, you have to take a metro (subway) in toward the middle of town and then switch to another, and perhaps a third one, to get out to the place where you work. Ditto with the bus lines. When the tramway is finished, you’d just hop on it and take it to work without having to go toward the middle of the city and switch lines. Supposedly, construction of the tramway will encourage more Parisians to leave their cars parked and take public transport instead. The construction of the tramway has been a real pain for neighbors and businesses in the area. So the city government tried to make it up to them by throwing a party for them on the 31st. I read about it too late for us to go, but we walked by there last night just to see what kind of havoc has been wreaked. There were plenty of people in the brasseries along the construction route, at least in the evening when the noise and workers had gone, so I don’t think the businesses are suffering too much. At least, I hope not. Ah, yes, we are in France. On another public transport system, the SNCF trains, a strike is expected to disrupt certain lines soon. And the kiosquers have announced that about 10 percent of them will go on strike starting Monday. 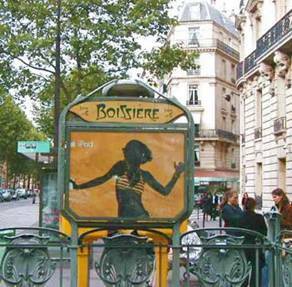 These are the newsstands that you see all over Paris. 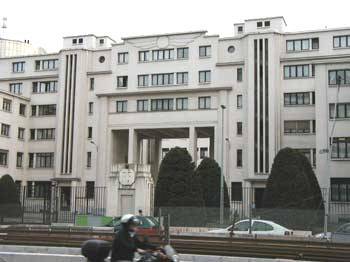 The folks who run them only make about 1000 euros a month – not enough to live on, especially in Paris. Another union was busily demonstrating outside the Musee Bourdelle in the 15th arrondissement yesterday. This museum, dedicated to the work of sculptor and painter Emile-Antoine Bourdelle, is owned by the city but is, like other city owned museums, seeking to supplement its funds by renting out its facilities occasionally. Two days ago, the museum allowed Pampers, the baby products company, to rent out a room there for a private, by invitation only, party. It was part of a promotion for a new soap for kids. The museum is perfect because the kids involved can run around and touch the sculptures, which are all very sturdy. But the museum workers union thinks it is really inappropriate to be using city facilities and city employees for private (read “capitalistic”) functions. So they installed themselves on the sidewalk outside the museum to pass out leaflets explaining the problem and their position. France would not be France without the unions and the strikes. We get into the spirit of it all when we are here. We had dinner last night at one of our favorite places, Oh! Duo, on avenue Emile Zola near the apartment. Madame and Monsieur Valero were very warm and welcoming toward us. I think we’ve been dining there for five or so years now. The food is wonderful. I had a croustillant with foie gras, and rabbit. Tom had a shrimp salad and steak. I guess I’m the one who eats more like a French person. The faces didn’t look so glum as they did at La Gaulloise the other night. Conviviality is returning slowly to Paris.